Lock in a great price for Hotel Pollux – rated 9.2 by recent guests! Wonderful breakfast. Cosy bar. Central location. Beautiful room. Fantastic location on the main walking street! In-house restaurant and bar were great. Nearby restaurants galore. Our balcony gave us a lovely view of the mountains. We were upgraded to the Superior room, we stayed 1 night. The hotel was near by the station, we didn't request to pickup or drop off but still staff offer us to drop off. Receptionist Staff went personally to the room to show us the room. Staff was courteous and helpful and guided us for tbe places to visit which save our time to visit. Having had a bad experience early in the week at a well known change hotel rn NYC. It was a true joy arriving at a small family owned hotel were every detail was considered. Anytinjg from a ride to the train station that’s literally a block away to making sure your room is serviced as many times a day as you want. The location AAA the staff is wonderful and the Rooms are large and extremely clean. Thank you Zermatt for the experience of our lives. We enjoyed our stay at the Pollux. Everyone on staff was helpful and friendly. Our room was spacious and very comfortable with great view of the Matterhorn. A beautiful room, fantastic breakfast, great service from the attentive staff. Great view of the main street, cozy rooms, lively restaurant downstairs, breakfast with views upstairs! Hotel Pollux This rating is a reflection of how the property compares to the industry standard when it comes to price, facilities and services available. It's based on a self-evaluation by the property. Use this rating to help choose your stay! 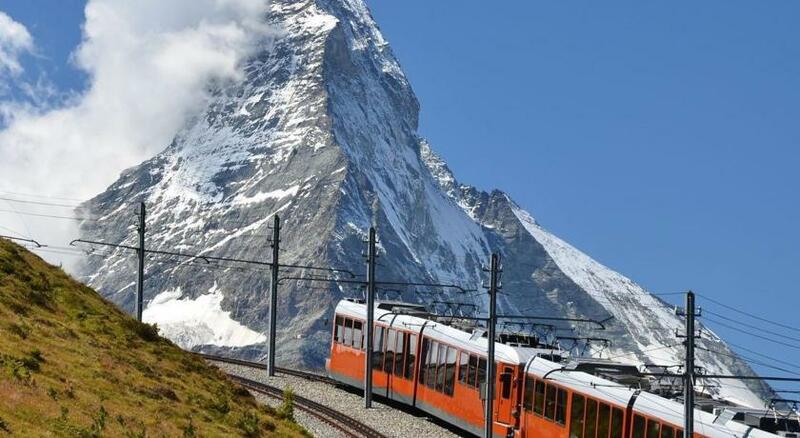 The Hotel Pollux in the center of Zermatt and 650 feet from the train station offers you newly renovated rooms, charmingly combining rustic elements with modern design. Enjoy tasty Swiss and international cuisine in the 2 restaurants of the Pollux hotel, relax in the hotel bar in front of the fireplace. A conference room, a relaxation area with a Finnish sauna, a steam bath, a hot tub, a magic shower and a solarium are at your disposal as well. When would you like to stay at Hotel Pollux? These rooms are furnished and decorated in a modern Alpine style and feature a balcony. One room with a double bed and a connected room with a bunk bed. It features a bathroom with bathtub for the adults, while the children enjoy their own shower. These rooms are furnished and decorated in a modern Alpine style. 1 room with a double bed and a connected room with a bunk bed. It features a bathroom with a bathtub for the adults, as well as a separate shower for the child. The bed is on a gallery and accessible via a ladder. House Rules Hotel Pollux takes special requests – add in the next step! Cash Hotel Pollux accepts these cards and reserves the right to temporarily hold an amount prior to arrival. Hotel Pollux accepts these cards and reserves the right to temporarily hold an amount prior to arrival. Clean and comfortable with a good restaurant snd bar. Staff so friendly and helpful and fun! Location was perfect. I really can’t think of anything - we loved our stay! Needs better blinds/curtains to keep out light from the street. Great location. Good view from the room. Great breakfast. Friendly staff. It’s location was fantastic, staff were excellent, the hotel had great food for breakfast, and we ate dinner in the restaurant twice. Everything was very fresh. Staff very friendly and helpful. Rooms were very comfortable and access to the ski locker was easy. Purchasing lift tickets from The hotel was also a great advantage. 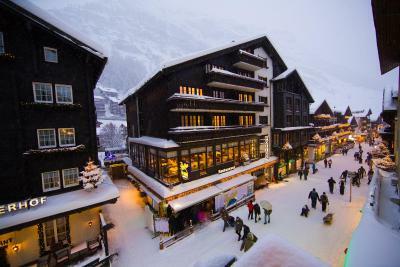 Great location - less than a 5 minute walk from the Zermatt train station. Water went cold and varied pressure many times during a shower. Shampoos etc not replenished in the 4 days we stayed. Location is great! Service staff between lobby, restaurant and bar very friendly. Rooms are warm and attractive. Bar has an open fire and is really cosy. Good fondue in the restaurant.